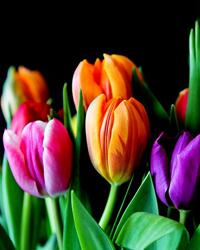 Obituary for Irene E. (Blaszczak) Merrill | Baker-Terravecchia Funeral Home, Inc.
Irene E. Merrill, 96, died March 19, 2019 in the Lafayette Manor Nursing Home after a short illness. A native of Uniontown, PA, she was a daughter of the late John and Victoria Blaszczak and proud of her Polish ancestry. She was predeceased by her husbands, Russell Moe, Ernie Erickson, and William Merrill, as well as her sons, Russell Moe Jr. and Douglas Moe. She was also predeceased by her siblings, Emma Blaszczak, Mary Baran, Ethel Jodoin, Helen Stallings, Joan Elsie Rozolosky, and Edward Blaszczak. Irene was a graduate of North Union Township High School, Class of 1940, attended Office Training school in Uniontown, then proceeded to Washington, D.C. to a job at the War Department where she met her first husband, Russell Moe. They moved to California and Irene became employed on the faculty of the University of California - Berkeley. Later she and Russell Moe founded an early tech business in radio and TV. After Russell's death in 1970 she continued working at the University, enjoyed playing golf and later retired and remarried. Her second husband Ernie Erickson passed away in 2000 and she moved to Oregon, married William Merrill, traveled, and continued her love of golf. Left to cherish her memory are her sisters, Laura Zartman, Lillian Lisiecki, and Lenora Brady, as well as many nieces and nephews.